Home sports €31m SIGNING OF MAN UTD LINKED MIDFIELDER, BARCELONA FINALLY WRAPS UP. €31m SIGNING OF MAN UTD LINKED MIDFIELDER, BARCELONA FINALLY WRAPS UP. Barcelona have completed the €31million(£27.5million) signing of midfielder Arthur from Brazilian club Gremio. The Catalan giants announced the news on their official website, confirming the player will sign a six-year contract with a buy-out clause of €400m (£350m). 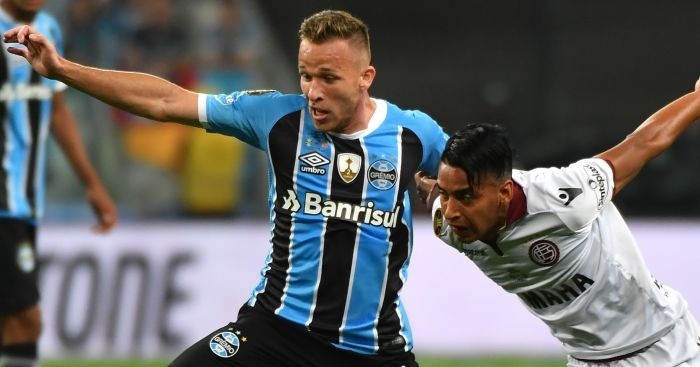 In a statement the club said: “FC Barcelona and Gremio de Porto Alegre have agreed the transfer of the player Arthur Henrique Ramos de Oliveira Melo, following the agreement the two clubs reached in March. The 21-year-old, who will join compatriot Philippe Coutinho in the Barcelona squad, is yet to make a full senior appearance for the national team. However, he has come through the Brazilian junior teams and starred in a Gremio team which won both the Copa do Brasil and the Copa Libertadores. Arthur started his career at his local club Goias before being spotted in 2010 by Gremio, then under the charge of former Chelsea boss Luiz Felipe Scolari. He was watched on multiple occasions by Manchester United, but it seemed the player always dreamt of a move to Barcelona. “There was a time when there were a lot of different offers on the table but I chose Barca,” the 21-year-old explained. Arthur revealed that both Neymar and Coutinho called him after he joined to congratulate him, while also stating that Barca chief Robert Fernandez played a huge part during the negotiations.